It’s not often hundreds of students and dozens of teachers willingly choose to attend school on a weekend. But that was the case on a sunny September Saturday when hundreds descended on North Country STEMfest, a first-time event hosted by faculty and students from the University of New Hampshire’s College of Engineering and Physical Sciences. More than 200 elementary and middle school students and three dozen teachers from 10 schools took part in the event, held in Berlin, that promoted science, technology, engineering and mathematics (STEM). The event was designed to provide inspiration, role models and hands-on STEM experiences for students —and to support educators. 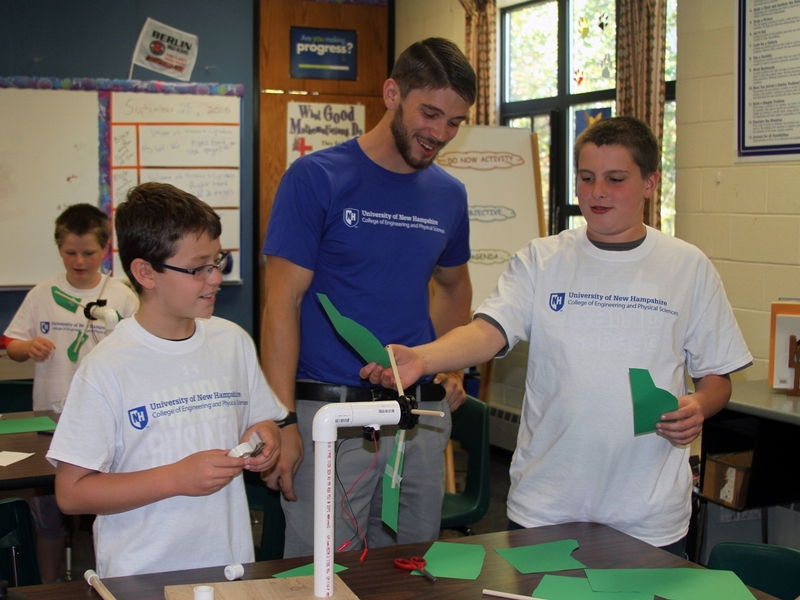 Drummond Biles, a mechanical engineering graduate student, helped elementary and middle school students design and test model wind turbines during North Country STEMfest, an event facilitated by the University of New Hampshire College of Engineering and Physical Sciences. Students participated in a minimum of two activities, such as designing and constructing wind turbines, operating a robotic transportation system, video game engineering, building a theme park ride and others. Sixteen UNH students and seven faculty members led most of the activities. STEMfest also included a professional development component for teachers, who participated in faculty-led activities such as “Great Bouncing Balls of Atoms,” where UNH associate professor of materials science Carmela Amato-Wierda explored the property of matter by having participants create bouncy balls and then measure the heights of bounces. 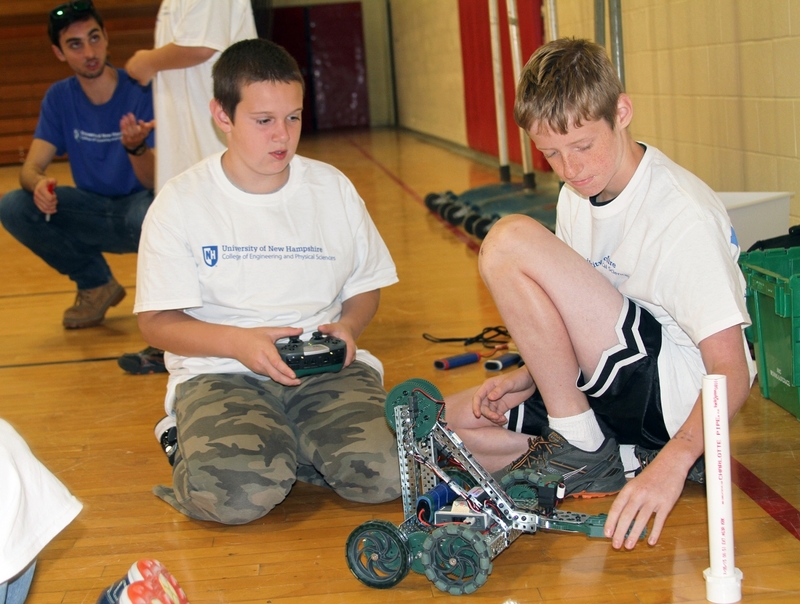 Students used VEX robots to complete tasks during the “robotic transportation system” activity, one of 14 offered during North Country STEMfest. Todd Lamarque, a member of Gov. Maggie Hassan’s K-12 STEM task force and principal of Lancaster Elementary School, said the event was a prime example of efforts needed to boost STEM education in the state. 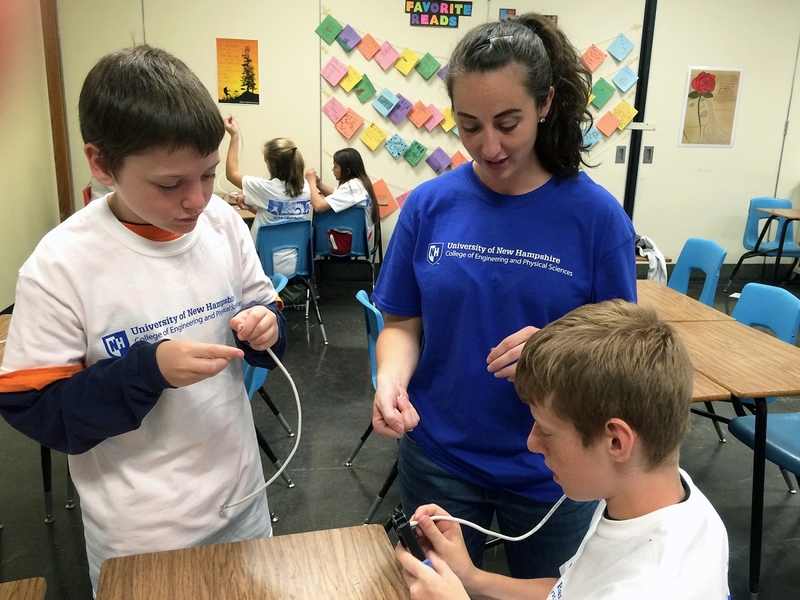 Amy Davies, a computer science student at the University of New Hampshire, helped students build and test their own Ethernet cords during North Country STEMfest at Berlin High School. Nearly 200 students from 10 North Country schools attended the event, which promoted science, technology, engineering and mathematics education through multiple hands-on activities. The task force has recommended addressing the opportunity gap in rural areas of the state like the North Country, and Lamarque said STEMfest was a move toward accomplishing that goal. Corinne Cascadden, superintendent of SAU 3, agreed. “We are always behind the eight ball when it comes to regional events and we always have to travel such a distance,” said Cascadden. “It means so much to be able to offer this to the students and the teachers. I can’t thank UNH enough for thinking of us and hosting this event.